Since starting Little Riot in September last year, one of the best business support organisations I have come across is Shell LiveWIRE. The longest-running enterprise support programme in the UK (30 years! ), the organisation supports young people aged 16-30 who want to start, or have recently started, their own business. They are best known for their "Grand Ideas Awards", a monthly competition in which budding entrepreneurs can apply to be in with a chance of winning £1,000. If you make it through the first round of judging, you are then invited to submit a one minute elevator pitch video which is then subject to public vote via the Shell LiveWIRE website. They give away up to 5 awards of £1000 every month. 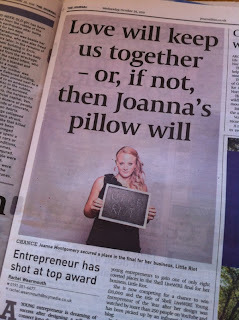 I won a Grand Ideas Award back in June and, at the time, had little idea of what was yet to come. In October I was honoured find out I'd made it into the "Hot 40" - a list of the top Grand Ideas winners from the past year. Never for a minute expecting anything further, I was amazed when I received a phonecall to say I was one of the 8 finalists in the running to become Shell LiveWIRE Young Entrepreneur of the Year. 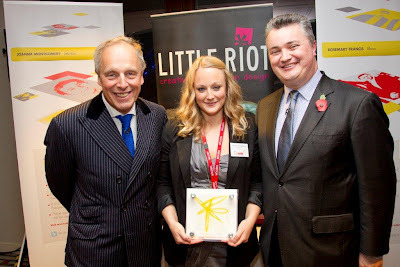 That day kick started an incredible few weeks for myself as a young businessperson and for Little Riot as a company. 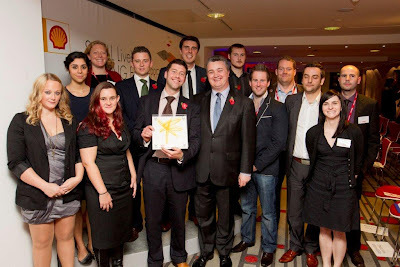 One of the greatest things about Shell LiveWIRE is the publicity they have the power to generate - I received a lot of press after winning my Grand Ideas Award and they certainly weren't holding back this time around either. As the only Scottish finalist, I was lucky enough to have Jonathan from Wave PR as my "right hand PR man" and he did an absolutely phenomenal job in generating a lot of buzz around both my company and myself as a finalist. If you you're based in Scotland, I genuinely couldn't recommend him enough - as well as being amazing at his job, he's also an incredibly nice person who is always at the other end of the phone whenever I need advice. I had a whirlwind time in the run up to my departure for London, squeezing in the submission of a business plan and other supporting documents to Shell LiveWIRE (for the judging process) around various radio interviews and photo shoots. On November 7th, in quite a last minute aaah-what's-happening-to-me flap, I rolled into London, arriving the night before the judging day. I checked into The Bloomsbury Hotel - which I also highly recommend if you're looking for somewhere to stay in London - and the next day I headed off to the Shell Centre to meet the other 7 finalists. We had an intense day - we all had to deliver a 10 minute presentation to one panel of judges, and were interviewed for half an hour by another. With that all done and dusted, we were glad to spend the evening enjoying dinner and drinks with the Shell LiveWIRE team. With the decision made, we just had a nail-biting wait until the LIVE! event the following day. 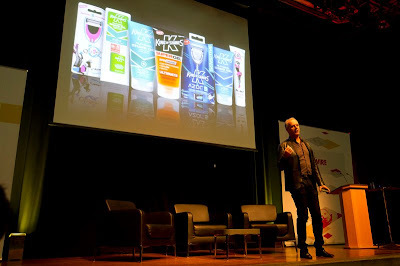 The day's activities, at the Southbank Centre, included talks from the likes of Will King (King of Shaves) and Brad Burton from 4Networking. As ever with Shell LiveWIRE, the content and speakers were spot on for the audience - relevant, interesting and highly motivating for the several hundred young entrepreneurs in attendance. The 8 finalists sat close to the front, torn between savouring the afternoon and wishing it away to get to the part we'd all been waiting for; the evening event and hence the announcement of Shell LiveWIRE Young Entrepreneur of the Year. After Brad Burton wrapped up with his motivational "Get Off Your Arse" talk (also the title of his book!) everyone headed back over to the Shell Centre for the evening event. For the finalists, this was an amazing opportunity for us to network and make connections. Each of us had an exhibition table on which we could display our products or offer leaflets etc. 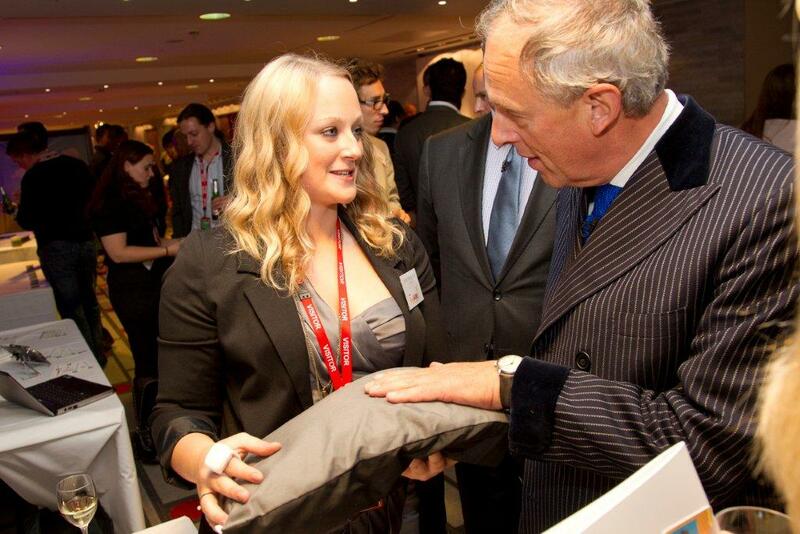 I took the opportunity to showcase my Pillow Talk prototype - I do this at every opportunity I get, as it's really fascinating/inspiring to see people's reactions when they actually experience the product, rather than just read about it. Simon Woodroffe of YO! Sushi had lots of nice things to say about it! After lots of pillows (but definitely not enough canapes or wine) we all took our seats and Oli Barrett took to the podium, cracking out several bad jokes over the course of the evening. Simon Woodroffe gave an absolutely hilarious talk - the man is wasted in sushi! Each of the 8 finalists then spoke to the audience for 60 seconds about their idea (Oli Barrett: "Joanna, when you ask for investment do people say "let me sleep on it?"")... and then came the moment we'd all been waiting for; the final announcement. Michael Korn of Kwickscreen was announced as Shell LiveWIRE Young Entrepreneur of the Year - so well done to him! Definitely well deserved; he has organically grown his company from an idea to where it is now and is entirely self-funded. For the "unlucky" other finalists - well, what can I say? I don't really feel like I lost! I still came away from the whole experience feeling like a winner. I had an absolutely incredible time, met some amazing people, made some valuable connections - and I got a bottle of champagne for being a finalists! No one's a loser when there's champagne involved. The other finalists - and now my friends - were Rosemary Francis (Ellexus), Isabel Lizardi (Bare Conductive), David Grimes (myParcelDelivery.com), Lawrence Kemball-Cook (Pavegen), Chris Dodson (Concept Cupboard) and Christopher Yeomans (Estriatus Energy). Stiff competition, and a bunch of people I'm happy to be placed amongst. All in all, Shell LiveWIRE LIVE! was an incredible experience and I'll definitely be heading back next year to see what 2012 has to offer. Thank you to the Shell LiveWIRE team for treating us so well and making the whole thing so amazing - hats off to Stu, Anna, Erin, Mark, Paul and also John and Wendy. I'm honoured to have been a part of it all and I'm sure I'll be reaping the benefits of the event for many months to come. I'm Jo, I'm 25 years old and I'm the founder of startup Little Riot. I generally blog about my life, business, design and technology. Oh, and the gym. I really love the gym. All content and images © Copyright 2005-2013 Joanna Montgomery, unless otherwise stated. Powered by Blogger.